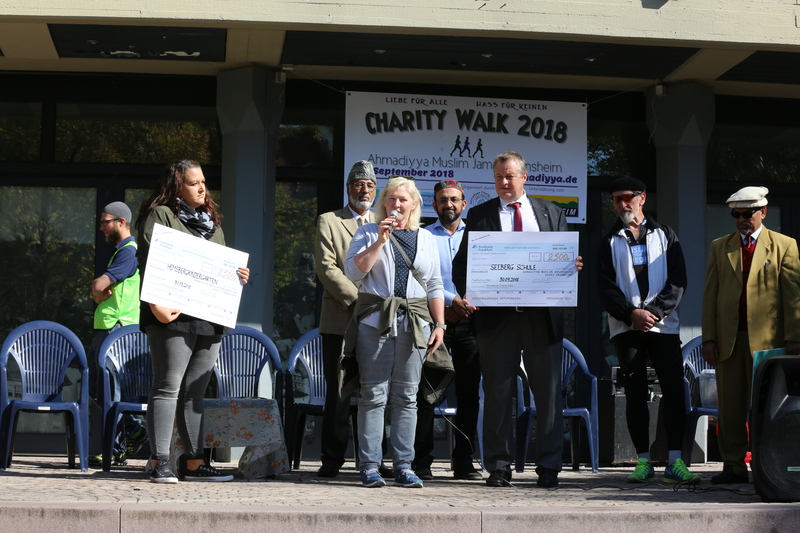 Auxiliary Organisation Majlis Ansarullah comprising male members belonging to Ahmadiyya Muslim Jamaat above 40 years of age is extremely active in organising charity walks through out Germany. With these events it promotes healthy activities in the society. Along with integration such events also facilitate introduction of another lovely face of AMJ. A participant CW struggling hard to maintain his position. 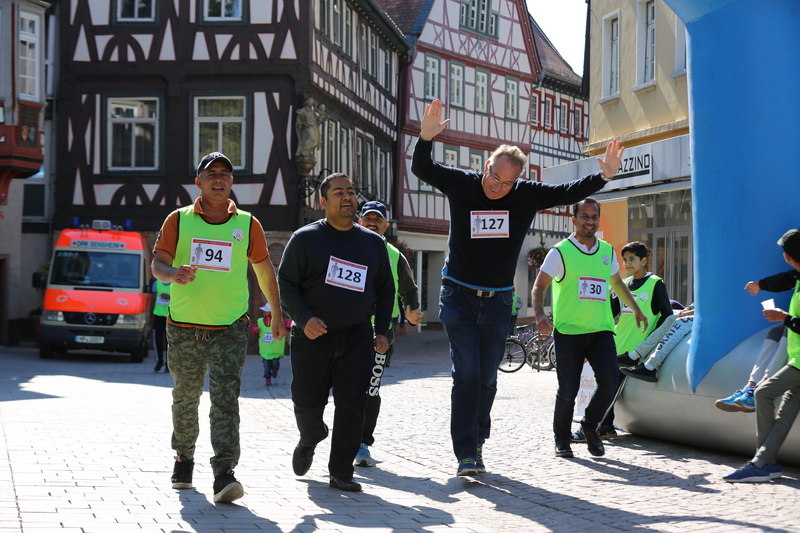 On 30.09.2018 in the city of Bensheim, 35 km north of Heidelberg was one of such events. Mr Rolf Richter, mayor of city Bensheim honoured to be the chief guest of the event. From AMJ side was present the national head Mr Abdullah Wagishauser. Mr Khawaja Rafiq who heads the national department ISSAR of Majlis Ansaruallh Germany drove specially to supervise the walk. In addition, Mr Farooq Cheema of National Ansarullah Germany, Mr Abdur Rehman Mobashar, National office bear of AMJ and Mr Daud Ahmad of National Ansarullah also graced the event with their presence. Mr Adnan Mahmood, being the in charge of Charity Walk executed the project amicably. Even ” Heavy Weights” trying hard to coup up. Charity Walk event is always scheduled to collect specific amount of money for subsequent distribution among welfare organisations as donations. For Bensheim the beneficiaries of donations were, Seeberg Schule (taking care of children with special needs), Evangelischer Hemsbergkindergarten and Humanity First Germany. By the grace of Almighty required amount was collected. With commercial firms and organisation Mr Abdullah Adeel put in the committed efforts and with in AMJ members Mr Nadeem Islam stood obvious in his efforts. Mr Sufyan Cheema excelled in distribution of Charity walk fliers in the city. 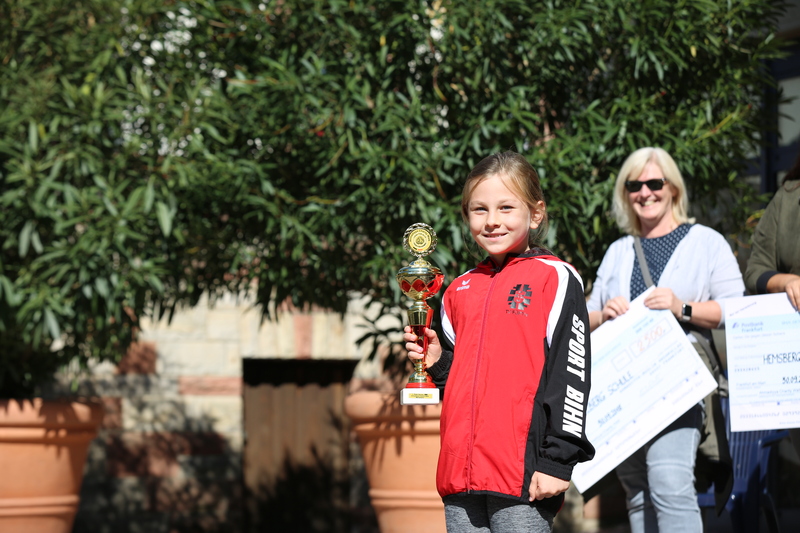 Small female child emerged to be the champion of CW in all aspects. 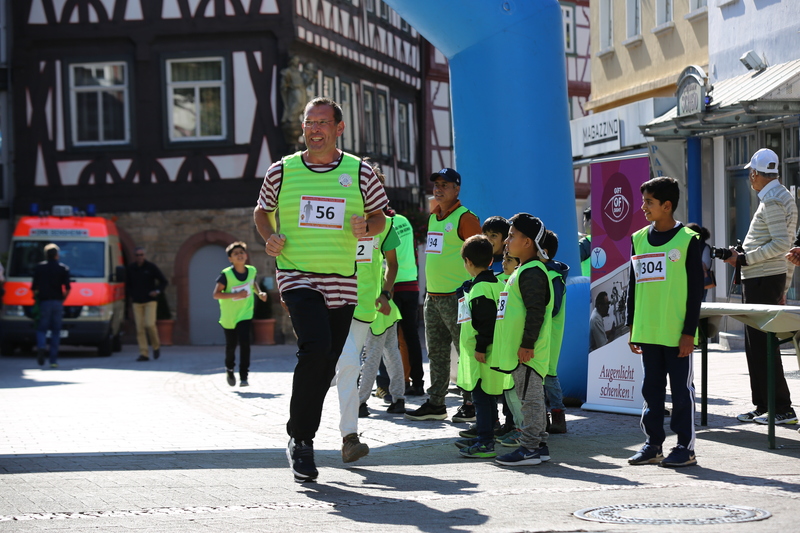 Above 200 participants belonging to AMJ, Seeberg Schule, Evanglischer Hemsbergkindergarten and city Bensheim took part in the event starting at 12.00 hours to 15.30 hours. 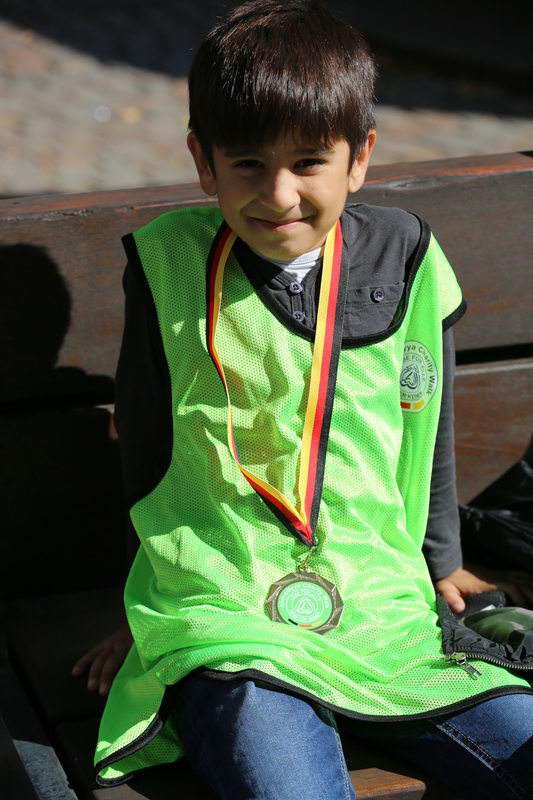 7 years old Binjamin also fought till the end to get a medal. Through out the event Mr Khawja Rafiq amused the participants with his light mood and interesting conversation. Mr Tariq Karim Arif of Humanity First conducted the kids quiz program with lot of fun. Mayor of city in his address appreciated the event as it facilitated creation of healthy atmosphere and integration among various segments of the society. He also distributed prizes and presented the checks to all three organisations. HF representative, Mr Hammad Härter in a noble gesture announced trasferring of HF money also to the children with special needs of Seeberg Schule. 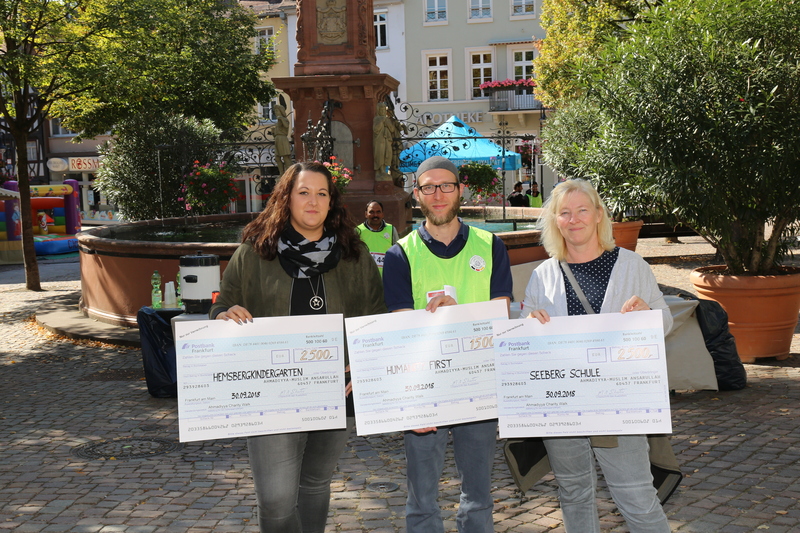 Mayor of the city presenting the Check of doanted amount to the director of Seeberg Schule. National head of AMJ, Mr Abdullah wagishasuer also standing with him. After distributing his part of prizes in his concluding remarks national head of AMJ, Mr Abdullah Wagishauser applauded the efforts put in by the Majlis Ansarullah Bensheim and wished continuation of such healthy programs in future also. All Recipients of CW collected donation. Bring Peace to the world ! It was pleasure to be part of the Charity Walk. Well done Majlis Ansarullah Bensheim. Another great effort from AMJ as this allows new people to meet and integration of different communities, also great for everyone’s health and many charities will also be helped from these efforts! 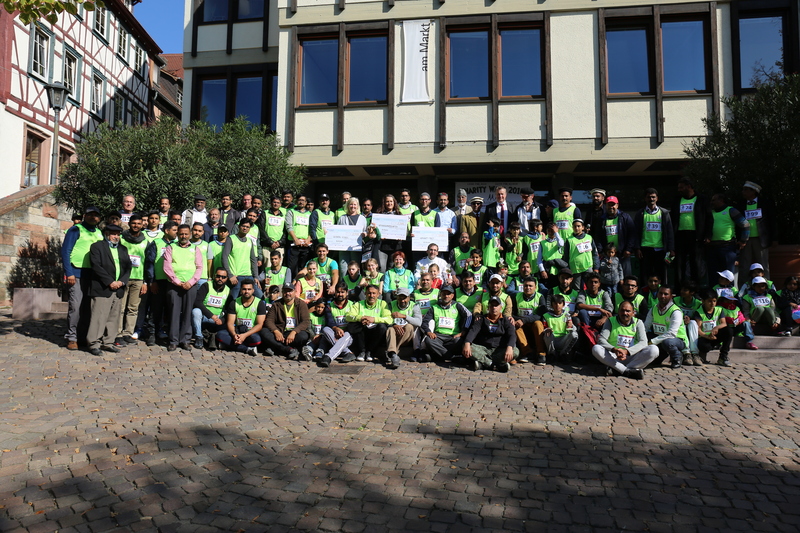 A successful event held by Germany Jamaat. We need to organize these events to bring awareness among others. It’s healthy not our body but also refresh our souls. It’s an excellent way to contribute in society .Muslims believe that “Love of country is part of Faith” so this is the spirit we need to make the world a better place.